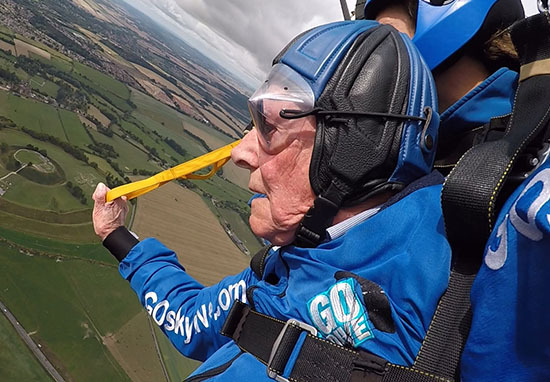 74 years after parachuting into Normandy during the D-Day invasion, a World War Two veteran returned to the skies for a skydive. 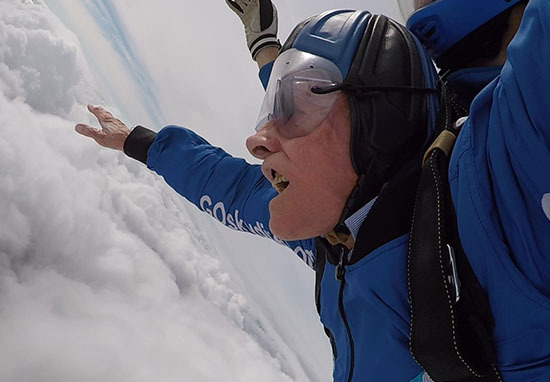 94-year-old Harry Read challenged any and all expectations you might hold about old age and skydiving when he jumped from a plane at 10,000ft on Friday (September 14) with GoSkydive. He had last performed such a stunt in 1944, when he worked as a Wireless Operator in World War Two. At 20 years old he was part of the Parachute Brigade landing in Normandy early on June 6. The great-great-grandfather, from Bournemouth, was inspired to take the leap of faith after visiting the Normandy battlefields on an anniversary tour earlier this year. To avoid attack during war time, parachuting would take place as close to the ground as possible. On that morning at 00.50 hours I parachuted into Normandy and 30 seconds later I was on the ground. It was a very different experience to the one I just had. This was my first high level skydive and whilst I was a little nervous I have always enjoyed the thrill of parachuting. The courageous man did the skydive at The Old Sarum Airfield in Salisbury to fundraise for The Salvation Army’s Anti Trafficking and Modern Slavery work. I’m bursting with life and vitality! It was amazing to experience the free fall and then cruising down was simply beautiful. I feel so lucky to have been able to experience this at my age. Before I could take part in the jump my doctor assured me my heart is as healthy as a middle aged man. Harry is reportedly already planning his next exhilarating experience, hoping to take part in a skydive next June as part of the 75th anniversary of D-Day. 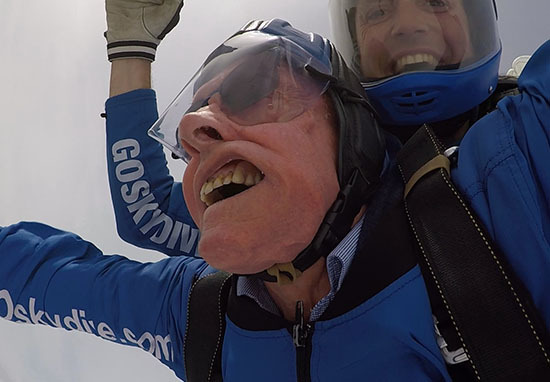 The inspirational nonagenarian explained that his drive for doing the skydive was his sense of faith overpowering his common sense. At whatever age we are, we are more than capable of shrinking from something that we feel is beyond us. But, I believe we should not withdraw from a challenge – yesterday is not our best, our best is tomorrow. I look forward to the chance to jump again next year in Normandy. His fundraising challenge has already raised over £5,000 for his chosen charity. Harry has previously served as the leader of The Salvation Army in both the UK and East Australia, and as Chief Secretary at The Salvation Army in Canada. It’d surprise our western world that trafficking is so rife here, that young women can be trafficked, our society always thought we were clear of this sort of thing, but it happens to men as well as women. It’s practically on our doorstep, and well, we ought to be doing something very special for it. 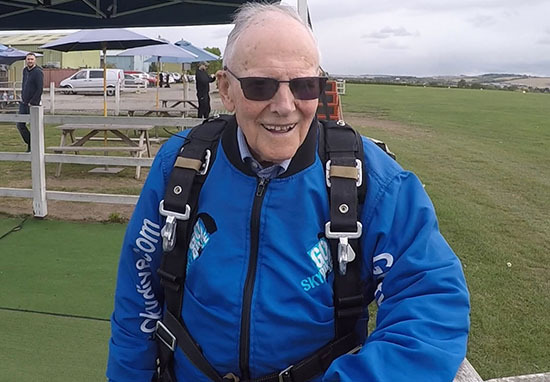 Harry’s skydive was a family affair, with his granddaughters Lianne and Joanna and his great grandson Josh also taking part. 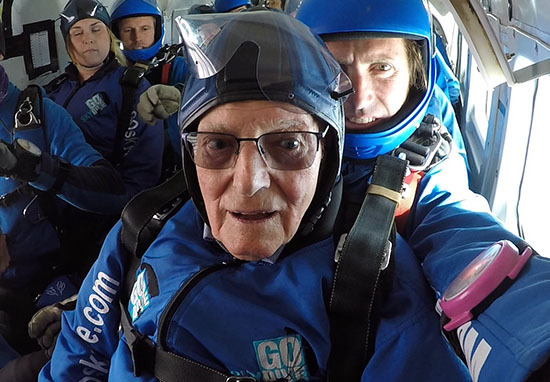 What an amazing man – I can’t imagine my great grandparents throwing themselves out of a plane! You can support Harry’s skydive through his JustGiving page here.